Nordstrom Anniversary Sale - It's Almost Time! Morning - happy Monday! Guess what is happening this week? The Nordstrom Anniversary Sale (early access) starts on Thursday - eek! I cannot wait! Last year I snagged so many great pieces that I wore all Fall and Winter, and even still wear now. To me, this is the greatest sale of the entire year... it even beats Black Friday. For real. So, first I'll let you in on the details, and then come back up and check out what I'm loving from their catalog. These will go live on Thursday, and I will link them on the blog! First things first, this isn't like any other sale. Typically sales are items marked down because they are going out of season. For this Nordstrom sale, these are all new arrivals for the Fall, and marked down up to 40% off. Once the sale is over, prices go back up. My biggest comment is that stuff sales out FAST, so if you see it and you want it, I suggest you buy it. Last year I held off on a few pieces because I had already packed my cart pretty full, but in the end, they sold out - and never came back in stock in my size. To say I was bummed was an understatement. If you're prepared for the sale, that will help things move smoothly, and make the sale fun and not stressful. 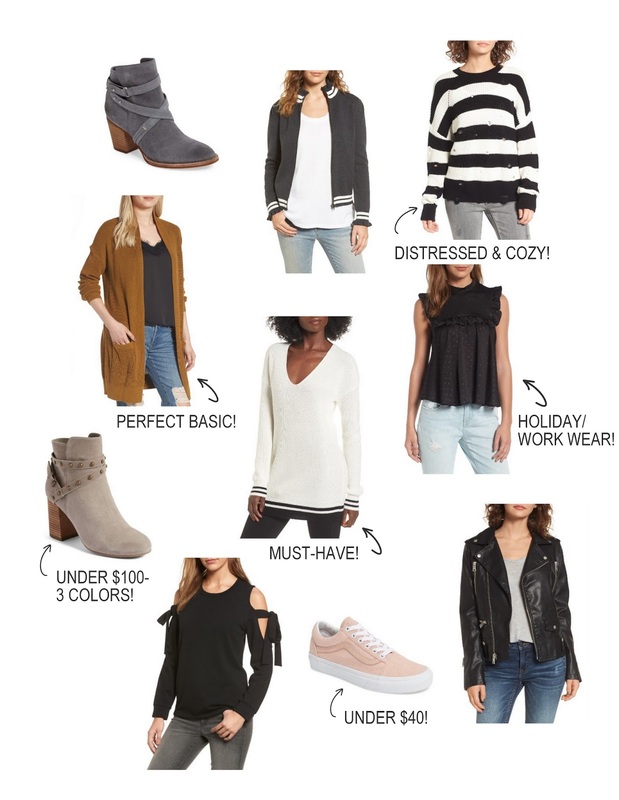 I typically make a list of must-have items for the Fall. If you know you need a good jacket, or a new pair of booties - this is the time to buy them. I snagged this jacket, and this jacket last year and wore them all of the time. The chunky knit sweater was also a hit, and I ended up getting it in two colors. So cozy and comfy; perfect for holiday dinners, or snuggling by the fire. I know it's hot as hell outside right now, so thinking about heavy Fall items is probably not the easiest thing. Seriously though, get with it. You do not want to miss this! Okay, so curious how you can shop the sale early? All you need is a Nordstrom debit or credit card. I got the debit card so that it links directly with my checking account, but credit is available as well, if you prefer that route. If you don't have one already, you can sign up for one here. I registered for mine pretty close to the sale, and had it within days. So if you're stressed about time, don't be. Just sign up for your preferred method here, and get ready to shop the sale. OH, and if you sign up for a debit or credit card, you also get a $20 credit to use during the sale. Score! If you're not into a new card - or don't want to deal with the chaos of early access - you can also shop the sale when it opens up to the public on July 21st. There will still be many great pieces available. Nordstrom tends to restock between early access and public access, so that everyone has a fair chance to snag some goodies. BUT, sizes sell out fast. I will be posting my top picks, favorite shoes, holiday and party items, fall staples - all the good stuff. If you miss the post sharing any of the above, you can also search the blog on the top right navigation bar for Nordstrom Anniversary Sale. Anything tagged with that headline will pop up. I will also have a direct link on the top left of the navigation bar, with new pieces being added frequently, similar to my Current Loves page. I hope you guys are ready. This is what I'm currently loving from the catalog, and definitely have a couple of these planned for my cart! Let me know if you have any questions. Be sure to follow me on Instagram as well, I will be sharing my purchases on there, and on Insta-stories before the looks hit the blog.